Hurstville, together with Upper Hurstville and ARNA, met with Stirling Properties on Wednesday May 18. As reported earlier, Walgreens has decided to move from Tchop into the Magazine American Legion Hall. Stirling plans to close on the property by the end of June. They will start construction in 6-8 months. While Stirling still likes the facade design displayed at the community meeting a few months ago, they understand that many do not. Keeping those neighborhood opinions in mind, Stirling is re-consulting architects Waggoner and Ball for a design more in keeping with the streetscape. One idea being considered is that the 90 foot facade be re-designed into three sections of 30 feet each to visually break the box up when viewed from the street. Stirling remains committed to communicating with the neighborhoods involved as things progress, and planning additional community meetings as the need arises. When the new design is completed, Stirling will let us know. Safety and Permits recently issued a letter to Stirling Properties confirming that no rezoning or variances are needed. Upon selecting a design and receiving permits from the City, construction will begin. When this building is returned to commerce, the parking spaces in the rear of the building will be more than adequate for Walgreen’s parking needs. I am interested in the lack of interest on the part of the mainstream press in this issue. As the owner of MIMI, a boutique one building downtown from this property, I am particularly concerned about the increase of vehicular traffic to this already congested block. I realize we the public have very little, if any legal recourse to be able to block Walgreens, and sadly I believe the lack of good zoning laws in our city will continue to create these kinds of issues. This will be a particular burden, once again to the homeowner’s in the neighborhood. There may well be “enough parking” for Walgreen’s customer’s, but where are all their employees going to park? The answer is, where all employees in the block park….in front of resident’s homes. This is just one more sad example of the lack of foresight on the part of our City leaders. It will ultimately lead to the demise of a lovely residential neighborhood. Too bad. Do you have off-street parking for yourself and your customers, or do you just object to the idea of Walgreens making any use whatsoever of street parking? I ask this because any new business in the American Legion building would add to traffic and parking problems, at least any successful business. What do you propose be done with the building if not a Walgreens, and why do you think that use would have less impact on the neighborhood? The problem with a large drugstore at this location is simply that’s a bad fit. This block on Magazine needs either smaller retail or, if its a larger business, an establishment where customers are not in and out in five minutes. The turnover of customers at Walgreens is astounding – stop by any weekend afternoon and you will see 5+ people in line and 10+ people in the store. The parking lot and this block can’t handle that sort of traffic, not to mention the added delivery trucks to the neighborhood. And Mimi is completely right, it’s the lack of good zoning laws and lack of backbone with our city leadership that gets us into these problems. If our councilwomen would take half an interest in this issue we could prevent this disastrous move from happening. As the Uptown Messenger has so thoroughly report, this neighborhood is currently having issues with Whole Foods and their request for extended hours and delivery times. We will be fighting this same fight with Walgreens in the very near future. Finally, it is a zoning issue. Drugstors are zoned C1A and not B1A. More of the point, drugstores with drive-throughs are zoned C1A. On those grounds alone, the BZA and City Council could put a stop to this. As always, kudos to the Messenger for the hyper-local coverage! The parking lot is large enough for a pharmacy by almost any standard, and that block of Magazine already accommodates a steady, heavy stream of traffic. Adding traffic from a single new business isn’t going to fundamentally change matters. Moreover, as I’ve noted previously, the American Legion hall is a large commercial building in a retail district. It cannot be used for small retail. It is ideal for large retail. The nature of retail is virtually always that people are in and out in a short period, so it is inevitable that any successful business that moves in will increase traffic. Your objection is so broad that it renders virtually any retail use impossible. I also find it a bit puzzling that you complain about the lack of adequate zoning when we already have over 50 zoning categories and New Orleans is well-known as a difficult city in which to open a business due to restrictive land use policies. In my view, Walgreen’s is not running afoul of zoning laws, but this is in spite of how onerous they are. Actually, they are running afoul of zoning laws. Have a look at the zoning – B1 does not specify drugstores as C1A does. It’s plain as day. And I did not complain about the lack of adequate zoning, quite the contrary. I complained about the lack of enforcement. Secondly, it most certainly can be used for small retail. There is nothing stopping Sterling from developing something akin to the building across from the fire station on Magazine, where CCs and Cafe Rani are located. This area is need of more small retailers, maybe a restaurant or two, etc. These small businesses would contribute to the character that made Magazine Street what it is today. Sorry, but Walgreens is not why people love Magazine Street. While you have a point about the lot being larger enough (although that’s debatable in my opinion), its the kind of traffic this sort of business will bring. My comment about it being used for a large retailer without the consist come-and-go of a drugstore, was in reference to the “rumor” of a Crate and Barrel being interested in that location. This sort of retailer (where customers tend to linger) would be much better for the neighborhood. Now, C1A specifically authorizes drive through pharmacies. However, at best that creates an ambiguity. B-2 would at least appear to authorize a Walgreen’s drive-through pharmacy because B-2 already authorizes drive-through restaurants and banks and other retail establishments similar to a pharmacy. This is crucial, because zoning laws are in derogation of private property rights and therefore must be strictly construed. In other words, wherever there’s an ambiguity, it should be read to favor the disputed use. This isn’t an enforcement issue. Most observers agree that the use is authorized under the zoning code. Why? Major cities all over the country have frustating parking issues. I doubt this has led to the demise of any of the desirable neighborhoods. Has parking run down any neighborhoods here? Is your store part of the run down of the neighborhood as well? Mimi is a classic NIMBY! I agree with Mimi. Maybe demise is a strong word to describe what will happen, but for certain this will overcrowd and change the atmosphere of this neighborhood corridor. Personally I love going to the Tchop store. If they close and reopen on Magazine, I will drive a little further and shop at CVS. What Walgreen’s is doing for hopes of a higher profit margin because of the clientel that shops on this strip of Magazine is quite greedy. They have definitely lost this customer! Plus, it will hurt the boutiques, like Mimi’s, because now I won’t want to go near this overcrowded area for any shopping needs! I’ll ask you the same question I asked Mimi. 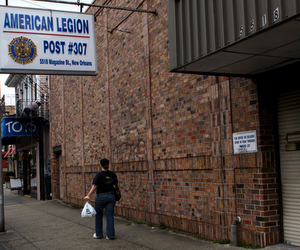 If not a pharmacy, what do you propose be done with the American Legion building? Do you just object to the idea of a successful business being there? The building is large and commerical but is no longer viable as a reception hall. It is too big for a boutique or other similar small business, and any new use will invariably cause more traffic issues. I just don’t see the basis for this opposition. You’d have to demolish the present building to construct something similar to the building across that houses CCs, Cafe Rani, etc. That building is open and has a large courtyard. The American Legion hall simply isn’t suited for small retail. I’d also note that there is already a Walgreen’s on Magazine, and it coexists fine with nearby small businesses. And as my earlier column pointed out, Walgreen’s has been in this city for over 70 years. Finally, there are only a handful buildings on magazine that can house larger stores like this, so there isn’t any danger of the small business feel of Magazine being taken over. The bottom line is that this is a lazy and opportunistic move by a developer who could care less about Uptown New Orleans. This company develops strips malls by dozen and wouldn’t know sustainable, neighborhood development if it landed in their lap. If the various neighborhood associations and council took a stand, they could actually derail this thing. Instead, everyone is happy to sit ideal by while Stirling turns Uptown in Metairie as we all heap praise on them for what a great job they did on the funeral home. Barf. 1. It’s hard to take anyone seriously when they throw in the “don’t turn Uptown into Metairie” line. 2. Couldn’t care less. COULDN’T care less.